Whether you’re just getting started in the new school year or have been out of college for years, most of us have to regularly remember new information and often teach it to others. Here’s a neat way you can use OneNote to help you memorize information with digital flashcards. Microsoft OneNote is a great tool for taking notes and storing information you don’t want to lose. But sometimes, simply storing information in our computers isn’t enough – we need to store it in our brain, too! One great way to make yourself remember information is to review it, then test yourself on your new knowledge. Flashcards are great for this, so here’s how you can bring flashcards into the 21st century with OneNote. Please note: We’re using OneNote 2010 in this article, but the same trick works in all versions of OneNote! To make a flashcard, first enter the word you want to remember on a new OneNote notebook page, then enter the definition in the next line below it. You could make the word bold and the definition italicized to help you differentiate them, if you like. 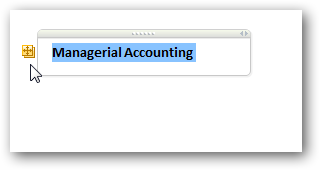 Now, with the cursor at the beginning of the definition, click Indent in the toolbar. Now, hover over the word, and you’ll see a blue box appear. Move your mouse over it, and double-click the blue box. This will hide your definition, and turn the box into a double box. Now you can simply view the definition by double-clicking the box again. Once you’ve reminded yourself, double-click to re-hide the definition. Now simply repeat this trick to make a whole set of flashcards. You could even make them while you’re taking notes in class! 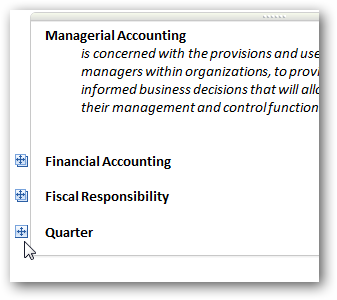 Whenever you want to review, just open OneNote and review your terms and definitions. Need to help your child or sibling brush up on their multiplication tables? OneNote flashcards work great! You can even use this trick to make flashcards with pictures. 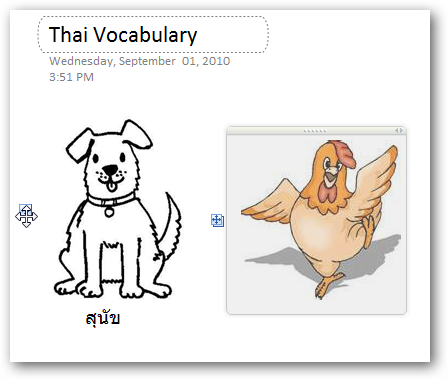 For example, you could make flashcards to help you practice foreign language vocabulary. Simply find a picture of an object, then write the name of the item in the other language under the picture. Intent and hide the text as above. Then you can use this to memorize the word itself, or as a easy way to test your spelling of the word. OneNote is a very versatile tool, so if you’re just getting started with it, be sure to check out our Beginner’s Guide to Getting Started With OneNote. Or, if you don’t have OneNote yet, you can download OneNote for free directly from Microsoft. Let us know what you use OneNote to help you remember! 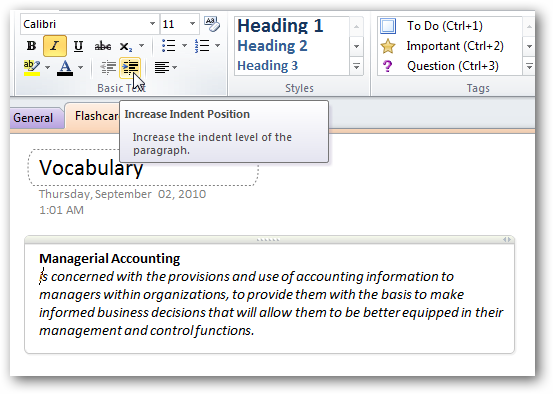 Hat tip to the Office OneNote blog for sharing this tip with us!